There are no photos with those IDs or post 1195 does not have any attached images! The wealth of the Asturian subsoil has determined the development, the social conflicts, the economy and the political tendencies of all Asturias. Although the mining sector it was implanted in the so-called mining basins of the Caudal and del Nalón, the whole Principality depended in some way or other on the avatars of mining. Even in the 90 decade of the twentieth century, after the mining crisis forced a major restructuring from the 70, including the gradual destruction of employment, one in four Asturian workers remained directly dependent on mining. Photo of Infoasturias - Pillo. To speak of mining is, therefore, to speak of Asturias. For more than two centuries, the Principality has contributed between 50 and 70% of all national coal production, being a basic source of energy in Spain from the mid-nineteenth century to the end of the twentieth. In this industrial context, which is so relevant to the entire Asturian society, it is where the cultural importance of a Museum such as the MUMI (Museum of Mining and Industry), built in El Entrego (San Martin del Rey Aurelio) in 1994 and that has become the museum par excellence of the Principality, being the most visited of all Asturias, with some facilities and exceptional contents and currently complemented with the Museum of the Iron and Steel Industry (MUSI), in Langreo. Unfortunately, there are many Asturians who have in their memory a relative, neighbor or friend who has lost his life in a mine or who has been affected by a chronic disease. He hard work, the narrow galleries have also been recreated in the MUMI in an excellent way. The Mine Image it is a millimetric recreation of the conditions at work and of the secrets of the real mine, of the labor trajín and of the threatening silences that seized the underground. The visitor can access this place through a hydraulic elevator that simulates a cage descending to about 600 meters deep. At all times the visit is directed by professional miners. Go down to the mine, with the guarantee that we are safe, does not put us directly in the skin of the miners but helps to understand them. We will discover all the systems for starting, extracting and transporting coal underground. At the same time that we walk through the galleries we will see the technological evolution inside the mine: underground workshops drilled by the work of the miner, the sheeters, the brushes and other intrusive techniques. We will put on our helmet and embark on an unforgettable journey to the bowels of our own "subculture". How to get to MUMI? The MUMI sits on the rubbish dump of the San Vicente well, on the banks of the Nalón River, a well that was self-managed by SOMA in the 1930s. The building occupies a plot of 27.000 square meters and its 5.000 dependencies. It consists of two floors that house thematic collections and hundreds of pieces of value among which we find a drainage machine of the XV century powered by human force, a steam machine with electric extraction winch of the early twentieth century; models of Newcomen and Watt steam engines; collections of Asturian minerals, collections of cartography, topography and chemistry; photographs, data, stories about coal and miners. The bathhouse reproduces not only the elements but also the atmosphere of that dependency that is a forced step to the entrance and exit of the well, in which the miners talk about everyday things and that since ancient times is also the most recurrent space of agitation syndicalist. We will approach one of the best historical collections of mine lamps, to the infirmary, we will stop to observe the Salvage Brigade, the chemical laboratories, the House of the Explosive, in which the manufacture of gunpowder and acid fulminates is forming an interesting space dedicated to the chemical industry. This is present throughout the careful facilities of the MUMI. The consolidation of mining in Asturias goes back to the second half of the 18th century, when the enlightened people of the time encouraged the extraction of hard coal to make the country economically progress. Previously, in the central zone of Asturias the peasants extracted the coal in an artisanal way in the reefs that surfaced at ground level in the councils of Siero and Langreo. Little by little, national and international capital founds extraction companies and mining wells begin to proliferate in the two large basins of central Asturias. Basins in which charcoal it had been gestating in a long geological process of sedimentation, favored by the presence of an environment with a lot of vegetation, which together with a very rainy climate, constitutes the raw material for the formation of this mineral. The railway from Langreo to Gijón, one of the landmarks of the Asturian industry, is inaugurated in August of 1853. The train transported about 103.000 tons per year while the Carretera Carbonera reached the 34.000; this supposed the takeoff of the production. In 1850, 60.000 tons are exported, in 1890 they were 620.000. In this last year, 1890, there was the first general strike It lasted two weeks to claim the reduction of the day to 12 hours and an increase in wages. Since then, the fame and the claiming strength of the workers is increasing. The labor movement of this time is articulated from 1910 with the foundation of the SOMA (Trade Union of Mineworkers of Asturias) by Manuel Llaneza. In 1919 the 84,5% of the miners were affiliated to this union. In 1920 there were in Asturias 34.000 miners. The Asturian mine also wrote with indelible ink part of the history of our country. The 4 of October of 1934 The Federal Executive Committee of the PSOE decrees a general strike throughout Spain as a protest against the entry into the government of the CEDIS ministers, but in Asturias it becomes an armed insurrection. For fifteen days the forces of the PSOE, UGT, CNT, PCE and BOC take power in the center of the region organizing a Revolutionary State. The Central Government sends the Legion and the Regular Moors to quell the revolutionaries. After hard confrontations, the Asturian miners put down their weapons. Repression takes over the mining basins and some 10.000 people are imprisoned, hundreds being tortured and executed. In asturias the civil War it also reached a great virulence due to the rancor existing since the October Revolution of the 34, being the second region with the highest number of deaths. Asturias resisted until October of 1937, date in which the national military occupies it. Then begins a brutal repression: 4.000 executed and more of 30.000 imprisoned, the miners constituting most of them. In 1980 the Government and HUNOSA agree to carry forward the plans to reduce the weight of mining in Asturias. These dates also coincide with the crises in the naval and iron and steel sectors. The situation is very serious and Asturias goes from being the sixth Spanish region (in 1955) to income per capita, to being the twenty-first (in 1985), and with a higher unemployment rate than the national average. The process of industrialization in the mining basins brought a disproportionate increase in the number of inhabitants in this area, as well as the uncontrolled alteration of the constructions, both civil and industrial. This resulted in the inhabited spaces have today characteristic elements unrepeatable elsewhere, such as the derricks of wells, factories, ships, housing workers, etc ... The industrial model of the Mining Valleys: coal, steam and steel, has led to a recovery process in the field of the leading industrial archeology throughout the country. The presence and success of MUMI visitors and the signaling of industrial routes have led to a recovery of an underestimated and forgotten heritage, whose value exceeds all expectations. The two paradigmatic rivers, Nalón and Caudal, are the best thread to follow the heritage of industry and mining. 1) Valle de Samuño: Ciaño-Traselcantu-Puente Coal-Town and mining facilities of La Nueva. Duration approx. 3 hours. Hiking or car. 2) Laviana: Entralgo-Canzana-Meruxalín-polygon of Sutu. Duration approx. 3 hours. Trekking. 3) Valley of the Flow: Ujo-Town of Bustiello-Moreda-Boo. Duration approx. 4 hours. Recommended to make in vehicle. 4) San Martín del Rey Aurelio: The Entrego-MUMI-Campa l'Abeduriu. Duration approx. 5 hours. Recommended to make in vehicle. C / El Trabanquín, s / n.
Punctuation: 7.9. of 4 votes. 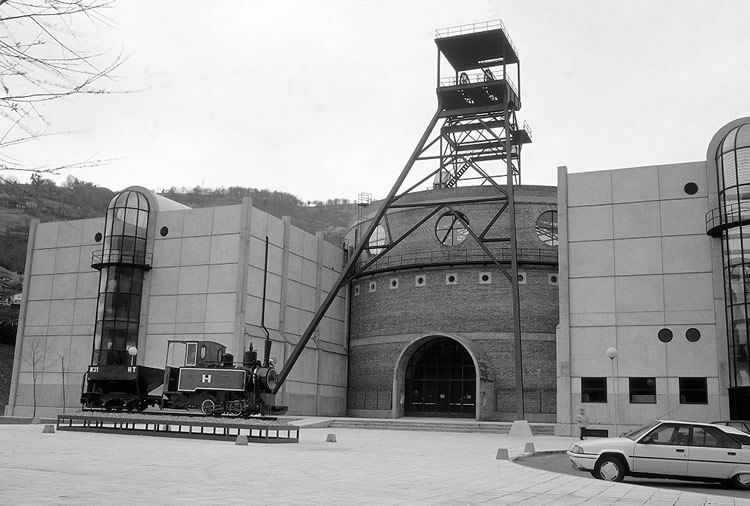 3 replies to "Museum of Mining and Industry - MUMI"